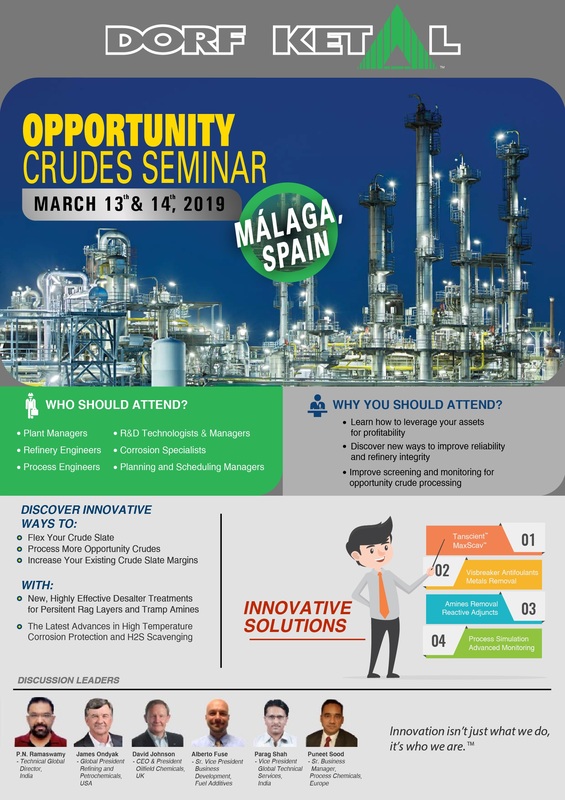 February 20, 2019 - The Dorf Ketal Opportunity Crudes Seminar brings together skilled professionals in Malaga, Spain on March 13-14, 2019 to provide new technologies and ideas to increase the efficiency and effectiveness of processing opportunity crudes. At this seminar, experts will share new perspectives on innovative ways to stretch desalter limits, process more high TAN crudes and overcome kero section fouling to increase refinery reliability and profitability. The shared knowledge will help refinery operations leaders improve throughput, reduce risk and increase the time between costly turnarounds. For more information, view the brochure, contact your local representative or email us at bvadmin@dorfketal.com to register for this intensive 1-day workshop. January 30, 2019 - Construction of Dorf Ketal’s upcoming plant at Dahej SEZ, in the State of Gujarat, India is currently underway. The Dahej plant will be Dorf Ketal’s 4th plant in India and the 2nd in the state of Gujarat. The plant will start commercial production in the month of June 2019. The new plant will not only help Dorf Ketal augment it’s production capacities but will also help launch new chemistries. December 13, 2018 – SMI Indonesia and Dorf Ketal Chemicals jointly published a case study in the December 2018 issue of Hydrocarbon Engineering. The case study presents laboratory and the Southeast Asian styrene producer’s operational data in replacing DNBP, a costly and environmentally harmful chemical in styrene production. The ACtify® trial demonstrated that it is possible to make sustainability profitable and has created a pathway for the total elimination of DNBP from the environment. The patented ACtify® family of Inhibitors and Retarders are a true, novel innovation and a demonstration of what ingenuity and a devotion to solving customer problems can produce.